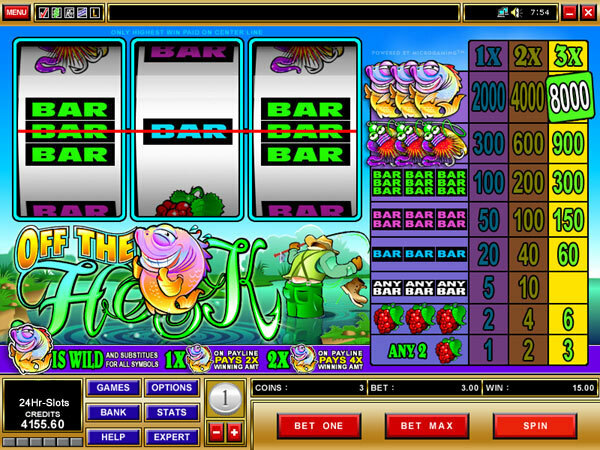 Off The Hook Slots is a brand new Microgaming online slot machine with great themes and better payouts. It is a three reel, one pay line game that offers a top prize of 8,000 coins! But what makes the game the best to play is the array of wonderful graphics, a simple premise and the always popular “Gone Fishing” theme. 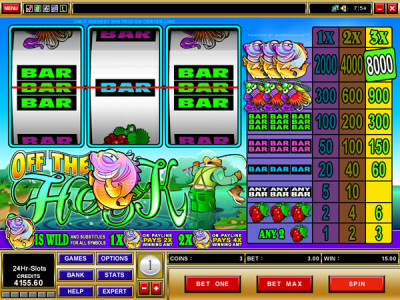 The game has symbols like Smiling Fish, Fishing Lures, Cherries, BAR symbols and a grinning fish that reminds you of the simple fun in life. There is also a Wild symbol that acts as a substitute for all other symbols to create winning lines and combos. There are the Multipliers and Jackpot Trigger. Multipliers increase your payouts and three Jackpot triggers will win the grand prize of 8,000 coins. The music is country-like, bringing the feel of the game and makes for a good way to pass time. Even though Off The Hook slots doesn’t have the best animation and graphics, it has a nice laid back feeling to it that many will appreciate. However, the game has some wonderful designs and a very silly looking fish that catches the eye and makes it fun to play.